I thought The Don was looking a bit lonely; so I acquired him some company yesterday, let me introduce you to Conzuela. She is tiny, only 1 inch high, and about to blossom a crown of red flowers. Here is a quick 3 min pen sketch of her; and then as a reminder The Don underneath. I love shells, not only are they beautiful, and each one unique, but they are a reminder of seaside jaunts and days long gone. Here is a sketch I made of two large shells using water-colour pencils and felt-tip brush pens. I’ve kept the drawing very simple as I wanted to attempt a repeat pattern. I am a fan of pattern design and in particular the work of Jacqueline Groag, but I have never attempted pattern design before. I imported my sketch into Photoshop and colour corrected to my satisfaction, I then isolated all the shell shapes into separate layers so that I could play around with them in different layouts. I introduced a seaweed motif; block coloured shapes and a blue background. Here is the pattern tile. I then copied and rotated the tile to create a repeat pattern; below is a pattern detail consisting of 4 of the above tiles. I am quite pleased with this for a first effort, more playing around I think with pattern in the future. I am not doing very well keeping up with my weekly sketch, sometimes life just takes you away from the things you would rather be doing. Anyway, after sketching my new cactus ‘The Don’ and being dissatisfied, I thought I’d give it another go. I am a bit happier about this drawing but it still isn’t quite there for me. I used pen, felt-tip pens, watercolour sticks wet and dry, and a little graphite pencil. I like this better than the first sketch as there is more definition of form on the cactus. I have been away on holiday in the Bay Of Naples (more on that later on), and so I haven’t posted any weekly sketches. All around the Bay Of Naples cacti and succulents grow splendid and huge, they are a treat to see. I have only seen comparable specimens in Kew Gardens glasshouses. On coming home I decided that I wanted my own little catus, a reminder of my trip. So here is a drawing of ‘The Don’. 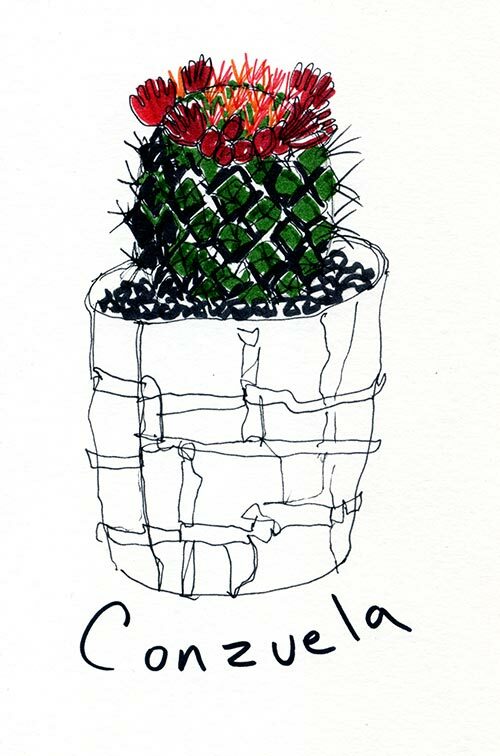 So for this drawing, I thought I’d draw on red textured paper as the cactus pot featured red glaze. I normally always draw on white paper, so this was a bit of an experiment. I started off drawing the form with felt-tip brush pens, immediately though I realised I couldn’t carry out the whole picture in this medium as all the light colours just turned dark on the page. So the felt-tip pens were used to draw the form and for the darker areas. For the greens and yellows I used watercolour pencil which sits on top of the red paper. The red paper is textured and so when the watercolour pencil is used dry it lets spots of red paper show through. The blue background is oil pastel as I wanted a good depth of blue. I must say I am not overly pleased with the result, the watercolour when used wet became blotchy on the catus, whereas I would have preferred more definition of form.